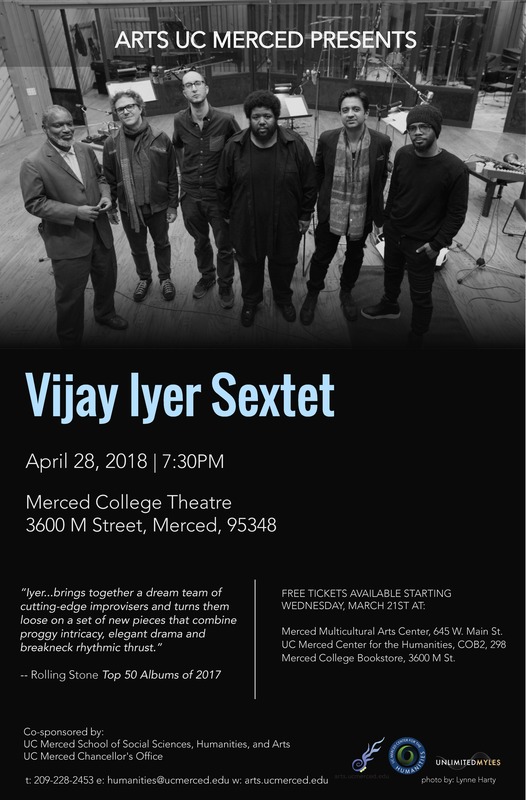 Arts UC Merced Presents is thrilled to welcome the Vijay Iyer Sextet to Merced for a free concert on Saturday, April 28th at the Merced College Theatre (3600 M St., Merced, CA). Iyer is a Grammy-nominated composer-pianist described by Pitchfork as "one of the most interesting and vital young pianists in jazz today." The L.A. Times praised the Sextet's recent album Far From Over as "rambunctious" and "furiously funky." Rolling Stone named Far From Over one of its 50 Best Albums of 2017, writing that "Iyer...brings together a dream team of cutting-edge improvisers and turns them loose on a set of new pieces that combine proggy intricacy, elegant drama and breakneck rhythmic thrust"; it was the only jazz album to appear on their list. Iyer is the Franklin D. and Florence Rosenblatt Professor of the Arts in the Department of Music at Harvard University. UC Merced Center for the Humanities, 5200 N. Lake Road, COB 2, Room 298, Monday-Friday, 9am-5pm SOLD OUT! No reservations by phone or by email. Maximum 2 tickets per person. If additional seats are available on the day of the concert, they will be filled on a first come, first served basis. Box Office/Lobby opens at 6:30pm; Theatre doors open at 7pm; Concert at 7:30pm. Ticket holders must be seated by 7:15pm or your seat may be released to the waitlist. Relaxed parking will be in effect in the lots surrounding the theatre on the evening of the concert. This concert is presented by Arts UC Merced Presents and co-sponsored by UC Merced Center for the Humanities, UC Merced's School of Social Sciences, Humanities and Arts and the UC Merced Office of the Chancellor.